A 2005 Stanford University study research shows how the mind controls pain. Health.com explains how Laura Tibbitts brain was scanned using a functional magnetic resonance imaging (fMRI). The scan focused in on the region of brain showing her pain. Her pain in her arm, shoulder and back was caused by a fall from a horse. Laura was then asked to imagine her pain increasing, at which point the fMRI results indicated the increase. The researchers then asked Laura to reduce her pain and once again this registered on the fMRI scan. Patients would say, ‘A-ha! For the first time I could see the pain in my brain, and I could control it. And that was a very powerful experience. Here at The Possible Mind we too believe this as to does our clients as this quote from our Pain Management page shows. The Possible Mind pain management session showed me many techniques to take control of my pain. I now see that I control it and not the other way around. Thank you. 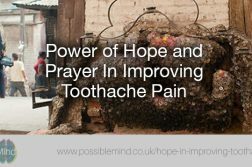 For more information or if you would like assistance in helping reduce your pain please contact The Possible Mind.